This Crossweave Reinforced Tape uses a synthetic rubber-resin adhesive for a high bond strength. 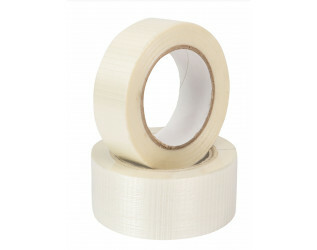 This strong adhesive makes the tape ideal for heavy duty, and high security, carton sealing. The self-adhesive plastic tape is reinforced with glass fibre strands, and this lateral and longitudinal glass fibre reinforcement provides optimum tear resistance. This tape is available in widths of 12mm, 19mm, 25mm, and 50mm. A lower cost alternative to this in our Monoweave Reinforced Tape.